1962 ✉ Germany - very nice collection \"history the postcard\" clean made up with inscription en masse ring binder. As well only old documents with Old German States and German Reich. 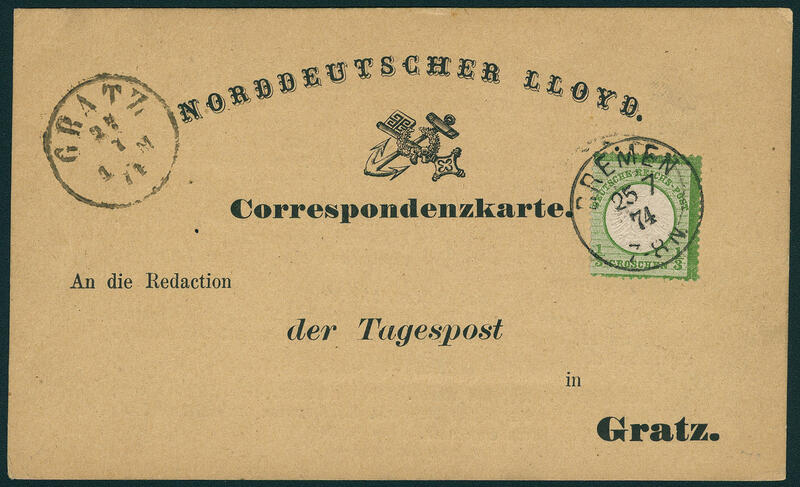 Included are numerous postal stationery, as well postcards, also mixed printed forms from postcards and so on. 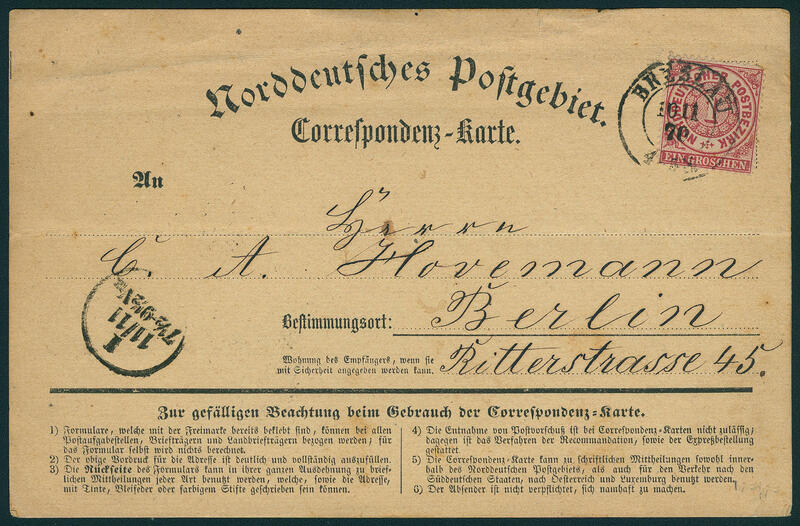 As well North German Postal District with correspondence cards, as well also Bavaria, Wuerttemberg, Heligoland and a very nice part German Reich / breast shields. An extraordinary object! 2049 /⊙ Germany - rich collection from varieties and special feature in a large stockbook accommodated. As well much interesting material, including an abundant part Federal Republic of Germany, as well Day of the Postage Stamp 1977 unperforated without gum, a collection from 124 different mint never hinged specimen stamps including welfare and youth sets, furthermore St. Andrews cross cancellations, plate flaw and so on. A magnificent object! 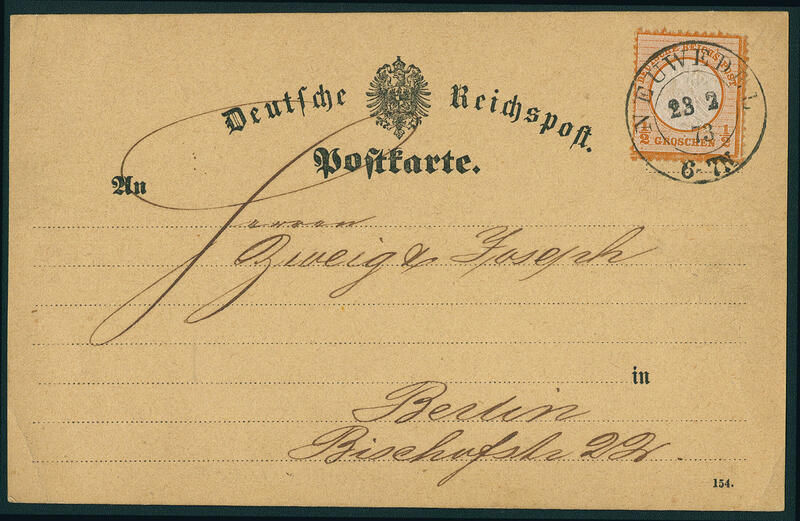 2062 /⊙/ Germany - extensive inventory in two large stock books as well a ring binder accommodated. As well a collection Third Reich with numerous different issues including complete sets, an extensive inventory German Reich, as well Federal Republic of Germany / Berlin stamp booklet abundant from Heuss including better issues, as well a large number souvenir sheets Federal Republic of Germany from Beethoven. Very favorable! 2076 Germany - extensive lot stamp booklet Federal Republic of Germany, Berlin and German Demokratic Republik (East Germany) in a large stockbook with a lot of material, numerous different issues, often multiple, also different types and so on. Enormous catalog value! 2077 x Germany - extensive inventory in seven stock books accommodated with lots of material, as well Federal Republic of Germany and Berlin with numerous mint never hinged issues, partly close one above the other puted, German occupation II. World war and so on. Huge catalogue value, very favorable! 2085 /⊙ Germany - nice collection in the safe hingeless printed form ring binder. As well New Saar with different issues including Heuss II mint never hinged, French zone with Rhineland-Palatinate red cross set mint never hinged and further sets, as well allied occupation / American/British Zone. Favorable! 2089 ⊙/ Germany - interesting old collection in the thick Schaubek illustrated album accommodated, the unused issues partial unfortunately stuck, as well an extensive part German Reich including better issues, plebiscite area, German occupation II. World war, as well also Austria. Favorable valued! 2091 /⊙/ Germany - interesting lot in three stock books. As well numerous issues former and New Saar, as well also interesting specialties with Federal Republic of Germany St. Andrews cross cancellations, varieties, as well Day of the Postage Stamp 1977 unperforated three times used and further material. Favorable valued! 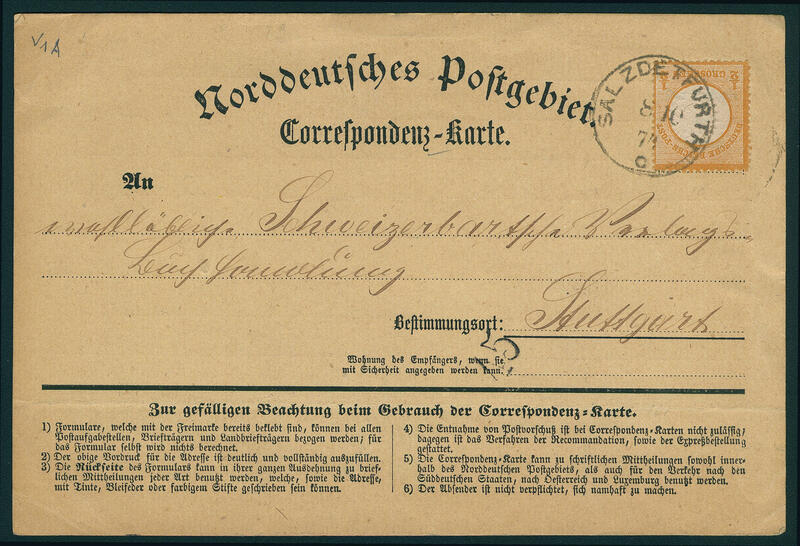 2095 /⊙/ Germany - extensive lot in a large stockbook. As well Federal Republic of Germany from Lower House of German Parliament 1949 with numerous issues, many mint never hinged postage stamps sets, with also Heuss II thirteen times mint never hinged, many sets Heuss medallion and Brandenburg Gate, German Demokratic Republik (East Germany) souvenir sheet us miniature sheet, Berlin with 20-30 Pfg. Goethe, numerous postage stamps sets mint never hinged, 20 Pfg. ERP, bell stamps and so on. Favorable! 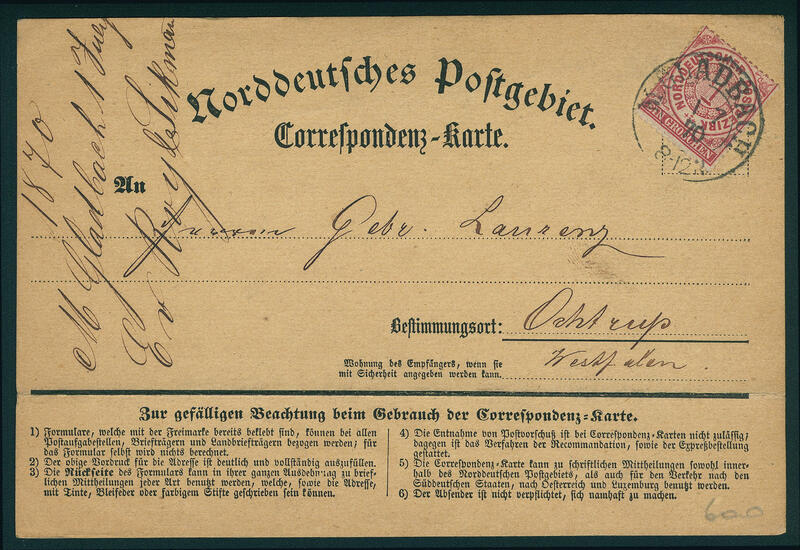 2107 x Germany - interesting collection \"the large Germany-collection\" in two corresponding ring binder as well mounted on pages accommodated. As well coins including commemorative coins Federal Republic of Germany and German Demokratic Republik (East Germany), as well mint never hinged issues, all very fine illustrates. With also Lower House of German Parliament 1949 mint never hinged partly is the collection the issue-area \"60 years Germany\" dedicated. A magnificent object with enormous subscription price! 2113 / 113/15, 91/100 Germany - nice collection in the lighthouse hingeless illustrated album. As well Federal Republic of Germany with useful first issues including Michel no. 113 / 15, 167 / 70, 171 / 72, 173 / 76, 200 / 03, Berlin with Michel no. 91 / 100, 101 / 05, 123 and so on. Favorable! 2134 ⊙/ / Germany - rich collection in two KABE illustrated albums accommodated, slightly mixed condition, a few issues stuck, as well Soviet Zone, Federal Republic of Germany from the fifties, Berlin with numerous values from the fifties, as well an extensive part German Demokratic Republik (East Germany) including many beginning valued, souvenir sheets, blocked value series and so on. Huge catalogue value! 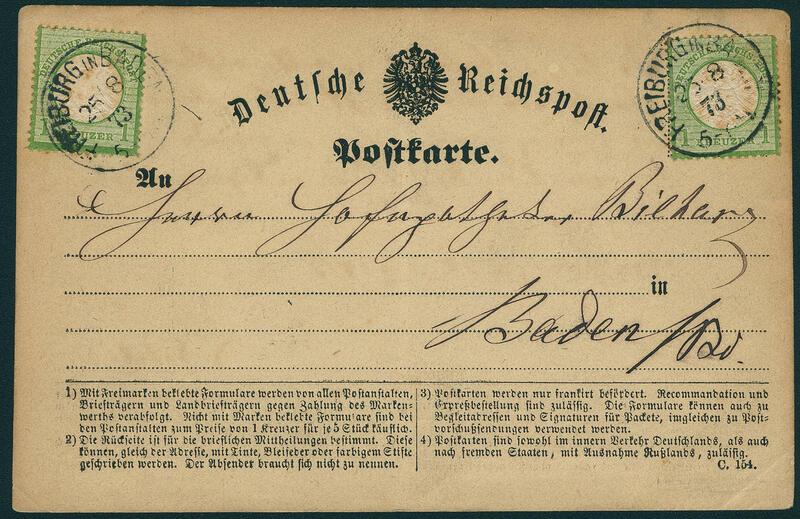 2263 /⊙/ Germany - extensive inventory in the spring back binder, as well housed in four stockbooks. As well an extensive part German Demokratic Republik (East Germany) including souvenir sheets, numerous nice letter pieces Third Reich with special cancellations, allied occupation with specialties, Berlin with useful first issues and so on. Favorable! 2316 /⊙/ / Germany - extensive lot in 10 small and large stock books accommodated, as well issues of different areas including much older material, as well German Reich, much Soviet Zone / German Demokratic Republik (East Germany) including DEBRIA-souvenir sheet, American/British Zone first issue of stamps for Germany after WW II. And so on, mixed quality, very favorable valued! 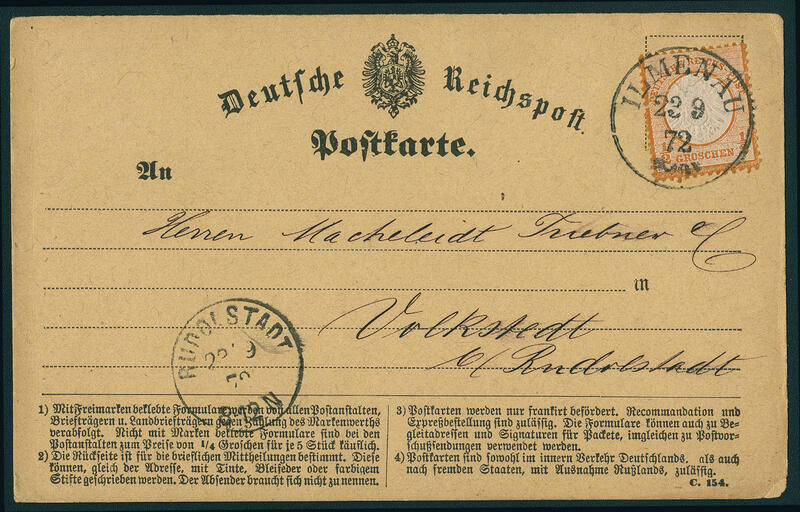 2459 /⊙/✉ Germany - nice inventory in the ring binder with plenty of better issues, as well Federal Republic of Germany including Heuss se-tenant, Berlin and so on. The net award amounts exactly 2268,- €. 2460 /⊙ Germany - nice inventory from all mainly mint never hinged issues in the ring binder, all on stock cards made up and excellent with numerous sought-after issues, better values and sets and so on. As well Old German States, Federal Republic of Germany with Heuss 1954, German Demokratic Republik (East Germany), Berlin red overprint set and so on. The net award amounts exactly 2767,- €. 2588 /⊙/ Germany - extensive inventory in the thick ring binder, as well much interesting material on stock cards, mainly better issues like Soviet Zone with Potschta on piece, Leipzig fair souvenir sheet 1946 with special cancel, Goethe souvenir sheet with special cancel, German Demokratic Republik (East Germany) with Marx souvenir sheet, German Chinese friendship mint never hinged from upper margin, as well further good sets of the early years, Federal Republic of Germany with numerous beginning valued, Berlin 60 Pfg. Reformation 1989 three sided unperforated in the pair with normal stamp mint never hinged, strong part German Reich with souvenir sheets, 1 RM. Chicago travel and so on. Perfect for liquidation, favorable valued! 2676 /⊙ Germany - clean lot of souvenir sheets in the stockbook with sought-after issues. As well Berlin monetary sovenier sheet 1949 in perfect condition mint never hinged, German Demokratic Republik (East Germany) all fours Marx souvenir sheet in perfect condition mint never hinged, Engels-souvenir sheet in perfect condition mint never hinged and once again with appropriate special cancel, Soviet Zone national theater souvenir sheet pair twice mint never hinged, Goethe souvenir sheet 1949 in perfect condition mint never hinged and so on. Favorable! 2677 Germany - nice mint never hinged lot in a large stockbook from the German Reich until the fifties, very few after, in the stockbook. As well numerous better issues including German Reich 25-40 Pfg. Wagner, 80 Pfg. Important German, Federal Republic of Germany with first issues as for instance Heuss 1954 twice, German occupation II. World war, German Reich se-tenants and so on. A clean lot, the be in the best way to the liquidation is suitable! Michel approximate 12800,- €. 2678 ⊙/ Germany - extensive collection in the thick KABE-Album. As well German Reich including Ostropa souvenir sheet 1935, as well Federal Republic of Germany and Berlin with beginning valued and so on. Huge catalogue value!